Are we being served … by our local politicians​? Here at the Waverley Web we’ve heard that membership of grassroots Conservative groups in this borough is falling … fast! And… due to internal squabbling, one local constituency is imploding! So has the march of Independents and Residents Associations begun? This week in Waverley the bulldozers have moved onto a variety of sites in Farnham and Cranleigh and planning applications and appeals for development on greenfield sites continue to flood in. Local residents are now hitting Facebook urging people to object to development before they even morph into schemes! Opinion: Are Residents Well Served by the Main Political Parties in Local Government? Whichever political party seems to be in power the pressure to build more houses seems to trump election promises to protect the green belt. Here in Guildford, it is the Conservatives who are pushing for new housing on the green belt and it is the Guildford Greenbelt Group (GGG), supported, intentionally or not, by a few Tory and Lib Dem rebels, who are attempting to check the proposed developments. Of course, before development can take place on green belt the council may remove the green belt status via the Local Plan process called “insetting”. Once inset the protection of the green belt legislation is lost and the council can then truthfully say it has not built on the green belt. As we watch successive developments threaten to continue to take over the green belt down the A3 corridor we also see some areas looking to independent resident association candidates to redress the balance. Epsom & Ewell District Council has been in the hands of independent resident associations for decades and we now see that control of Elmbridge Borough Council has shifted the same way with resident associations forming a coalition. In 2016 Elmbridge Borough Council finally had a new leader after the borough’s Residents’ group and Liberal Democrat group formed a coalition to end eight years outright Conservative control. So will we see more resident associations become affiliated nationwide and select their own independent candidates for the 2019 local elections? GBC councillor David Reeve (GGG, Clandon & Horsley) wrote in the East Horsley Parish magazine: “I think it is worth considering whether our local council would be more responsive to residents’ concerns if its composition was more like that in Epsom & Ewell, where 30 from the total of 38 councillors are representatives of a local grouping called “Residents’ Associations of Epsom and Ewell”. Tim Murphy, chairman of the Epsom & Ewell branch of CPRE, (Campaign to Protect Rural England) wrote along similar lines in the Autumn 2017 issue of the CPRE’s Surrey VoiceMagazine: “Two years ago, three candidates of the Guildford Greenbelt Group (GGG) won seats on Guildford Borough Council on a ‘Defending the Green Belt’ manifesto – Susan Parker and Mike Hurdle in Send and David Reeve in Clandon and Horsley. In Tandridge, the councillor for the Portley Ward in Caterham, Cllr Clive Manley, left the ruling Conservative party in protest at the council’s plan to build over 9,000 new homes in the district, entailing the loss of large swathes of the green belt and open spaces. He said: “I was elected last year on a platform of opposing significant new development. His comments echoed those of the Conservative councillor for Clandon & Horsley, Matt Sarti, during the debate on submitting Guildford’s Local Plan. He said all his consultation with his constituents indicated they were overwhelmingly against parts of the plan which compelled him to vote against it. Tim Murphy continued: “Even more recently, at the local elections earlier this year, Independent candidates representing local residents’ associations found themselves catapulted into overall control of Elmbridge Borough Council, toppling longstanding councillors from the previous ruling party. “Are we seeing, here in Surrey, the beginning of a groundswell movement where candidates who are prepared to oppose their councils’ unrealistic housing targets are elected at the expense of those who are not willing to stand up for the interests of their local electorates? But Murphy argues local authorities don’t have to accept these numbers and gives an example of Reigate & Banstead Borough Council which, he says, has successfully resisted the very high housing numbers proposed for the district. But apparently, GBC need not be too concerned. When asked if this matter had ever been discussed at their committee meetings or whether they might consider extending their affiliations to make such a move possible in the future, Amanda Mullarkey chairman of the umbrella organisation the Guildford Residents Association, which represents 25 residents associations and parish councils, declined, on more than one occasion, to reply. Perhaps this potato is just too hot to handle? 6 Responses to Opinion: Are Residents Well Served by the Main Political Parties in Local Government? I wholly support David Reeve’s statement and encourage those in Residents Associations to stand for council positions in 2019. I’d be so impressed if we could get even half of the council to be made from Resident Association candidates. It will be healthy for our borough and local democracy. It is disgraceful that Mrs.Mullarkey refuses to comment on this issue which has a real groundswell of support. What is the point of her position if she will not comment on or support this drive for competent administration out of the hands of the political parties. If councils do not listen to their electorate I predict that we shall start to see civil unrest. The moribund Conservative borough council in Guildford should be replaced by independent councillors who care about the area and who will listen to their electorate. The current set up must be terminated at the earliest opportunity. Unfortunately for Guildford, the GBC Executive has done anything but stand its ground over unsustainable housing targets. If anything it has artificially inflated the target through its top secret, undisclosed, “black box” methodology, which it continues to refuse to disclose. 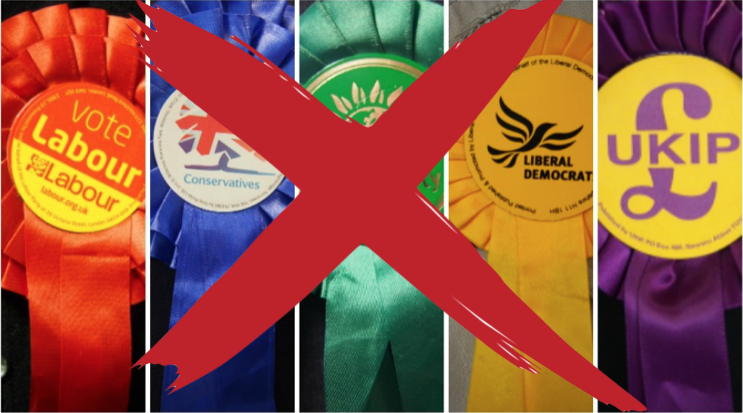 Let’s hope 2019 [when the next GBC election is due] is the year of the independents, GGG, and residents associations. In my opinion, concert parties are not compatible with real democracy, especially when coupled with a first-past-the-post electoral system. The argument most frequently offered in favour of FPTP is that it leads to strong government, but experience indicates that the electorate is badly served wherever and whenever one party dominates. In practice, it favours the established political parties who support it. Another problem is that of character. To quote Douglas Adams “it is a well-known fact that those people who must want to rule people are, ipso facto, those least suited to do it”. Unfortunately for us, character seems in short supply at GBC, apart from GGG and depressingly few honest individuals from the other parties. These individuals tend to be reluctant politicians, who have sacrificed their private lives to a greater cause, without allowing personal ambition to cloud their judgement. Where is the character in tweeting offensive comments to fellow councillors? Where is the character in ignoring the wealth of objections to the discredited Local Plan? Where is the character in hiding vitally important calculations on the housing need? We should ask ourselves why we have allowed such characterless and mediocre individuals to govern. Arise, the independents and residents’ representatives. John Fox on Did You Work For The Getty Family When They Lived At Sutton Place? Peta Malthouse on Letter: I Feel Sorry For The Rough Sleepers But One Told Me to F*** Off! Paul Robinson on Letter: Look At The Little Yellow Line They’ve Painted In My Road!